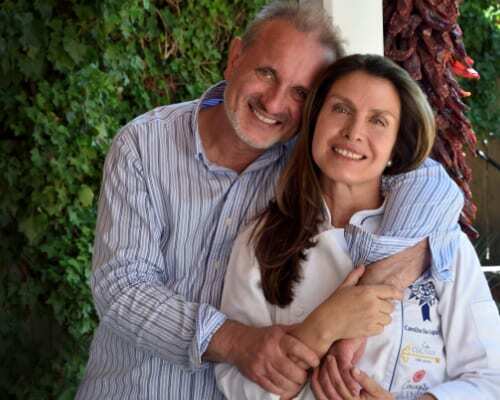 Carolina Olea Cosignani and Manuel Lezcano de Orleans are the owners of Casa Culinaria – The Gourmet Inn, where they have given free reign to their passions for first-class hospitality and haute cuisine. Manuel and Carolina have chosen an international and multicultural lifestyle that has allowed them to define themselves as cosmopolitans and hardened travelers. On one of their many adventures they discovered Santa Fe, New Mexico and fell in love with its history, traditions, scenery and architecture. They found in this city a corner of the world in which many cultures live together, recognizing tones unique to its environment. The Spanish, Mexican, and Native American cultures coexist in the capital of the Southwest in an extraordinary manner, giving rise to a unique and eclectic identity. Santa Fe gave them the possibility of giving free reign to the most important adventure of their lives. They founded Casa Culinaria – The Gourmet Inn in January of 2017 to offer a space brimming with details, aromas, and flavors. Carolina is a formal chef with a “Grand Diplôme” from the famous International Le Cordon Bleu in both “Haute Cuisine” and “Patisserie”; Manuel is an experienced sommelier and aesthete. Both will make your stay a truly gourmet experience.